To the barber who clipped his hair in the Burlington Arcade in London he said quite seriously: "Don't make me look like an orang-outang." As a matter of fact, Joseph Pulitzer possesses the best kind of good looks, those which indicate strength of character, concentration of purpose and the capacity for strong feeling. What the reader wants to know about Mr. Pulitzer and what I shall try to tell him here are some of those things which he has not heard already. Joseph Pulitzer was born a little more than fifty years ago. He lived in Hungary un­til he was seventeen years old. One of his relatives is Professor Politzer, of Vienna, a distinguished scien­tist. His father was a college professor, his uncles were offi­cers in the Austro­-Hungarian army. The infantile Pulitzer, aged seventeen, thought that fighting was the noblest hu­man occupation. When he started for America his idea was to go to Mexico and get to fighting in the army there. One of his relatives was or had been a Mexican army officer. He landed at Boston and came from there to New York. He was then a lank, lean, powerful young man with a smooth face, long upper lip, long, strong chin, very high top-head, clear gray eyes, unlimited nervous energy and a freedom from ac­cepted ideas, from accepted beliefs in the importance of property, vested rights and so on, which made it possible for him to become, first, a useful, successful journalist, and, second, a very rich man. On the way over, the young Pulitzer talked to sailors, and his absorbent mind made him believe that his future was an ocean life. The Mexican army - Mexicans fight about nothing in particular - faded into the dis­tance. He landed on American shores, saw the struggle for a mean living, was thrown with men who knew as much about his mental processes and unlimited ambition as they knew of trigonometry, and he made up his mind to go back to the sea. He applied for and secured an appointment on a whaler, a sailing vessel bound for a three years' cruise to the north. Here you may observe how good men are providentially saved for important work. If Joseph Pulitzer had got aboard that whaling ship, he might be at this day cut­ting blubber off a whale in the neighbor­hood of the North Pole, or more probably starting a mutiny to execute a captain guilty of treating his men cruelly. Something went wrong, and Joseph Pul­itzer failed to get the berth on the whaler. At this time he could not speak one word of English. He spoke German and Hungarian, and he knew how to read Latin. That was his equipment for dealing with America. He learned that war was going on in the United States, that some of the men who did not believe in slavery were fighting against others who did believe in slavery. He joined the army of the North and served in the cavalry until the war ended. The future solemn historian who writes the history of Joseph Pulitzer, "one of America's great editors," will probably dwell on the fact that Pulitzer was present at the battle of Gettysburg. It seems to me that other things are more important in his war record, especially three things. First, he cleaned his own cavalry horse and at least one other horse belonging to an officer. Here he learned a good deal about the reality of life. Second, he came in contact with a whipper-snapper officer, brutal to his men. This officer needed a lesson and he got it from Pulitzer, who knocked him down and was arrested to be held for court­-martial. One day an old general of German blood was hunting around for somebody who could play chess. He was told that a young Hungarian named Pulitzer, under arrest for striking an officer, was said to be able to play chess very well. Fortunately, to this old general chess seemed more important than court-martials, and he had Pulitzer brought from his im­prisonment to play chess with him. He was so amazed at the young man's mental force that the court-martial was patched up and Joseph Pulitzer was never tried. The old general deserved credit in view of the fact that he never won a game. At the end of the war Joseph Pulitzer had added to his worldly possessions a limited knowledge of the English language and two or three dollars left over from his pay. He tried to sleep in the City Hall park, but was disturbed by vigilant police­men. Then a kind-hearted fireman allowed him to sleep in the furnace room of French's Hotel on Park Row. Before the night was over somebody else who came on duty turned him out of there. He afterwards bought French's Hotel, tore it down and built the present "World" building on its site. Soon after the war he went west to St. Louis. Traveling was different from what it is now. People crossed the big muddy river in ferryboats. Pulitzer had no money to cross. He offered to earn his passage by going back and forth a few times and working as fireman. His big muscles and his force of will made him a very good fireman, and he was per­suaded to stay on the boat at good wages for some time. Before his real success began Joseph Pulitzer did all kinds of work, and after his success began he was proud of this early work in the right way. He learned by ac­tual experience that it is worthwhile to help the man at the bottom. He did not tell others about it after the fashion of the usual self-made, badly-made citizen. But he told his children about it always and impressed on them the fact that whatever they got from him they owed to his capacity to do hard work honestly when hard work fell to his lot. Joseph Pulitzer was a member of the legislature in Missouri a little before he was twenty-one years old. Throughout his life he absorbed largely the ideas surrounding him. When he was a hardworking young journalist he was extremely radical. Carl Schurz was the editor of the "Westliche Post," on which Pulitzer was a reporter. Very often when a man called upon him Carl Schurz would say: "Before you go I want you to see the most interesting young socialist in Amer­ica," and he would say to the boy: "Ask Joe Pulitzer to come in here a minute." Mr. Pulitzer's great success was the es­tablishment of the "St. Louis Post-Dis­patch," which at this day is the most suc­cessful newspaper in the state of Missouri. The paper was made successful, as was the "New York World" later, by attacking injustice, by refusing to recognize the claims of the rich to especial privilege, by working honestly for the great mass of the people who lived in the condition from which Pulitzer had emerged, thanks to favor and heredity. 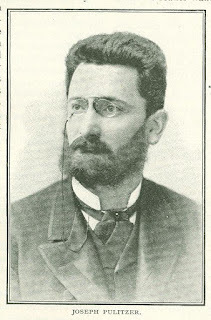 Joseph Pulitzer was thirty-six years old when he had made a national reputation as a public speaker and as an editor. He had, or thought he had, all the money that he wanted. His St. Louis newspaper brought him in an income of one hundred and fifty thousand to two hundred thousand dollars a year, and he decided that he would go abroad, as he had done once before, to study and give his brain a chance to make up for the time he had wasted in purely material achievements. Unfortunately for his own physical com­fort and fortunately for the world which needs vigorous fighters, Joseph Pulitzer's plans were changed. He saw an oppor­tunity of purchasing the "New York World" and establishing a real newspaper in New York city. No real newspaper existed there at that time. His doctor warned him against undertak­ing extra work, told him that violent effort and excitement would break up his health and perhaps ruin his eyes, already weakened by a combination of hard newspaper work in the daytime and reading late at night. While Joseph Pulitzer had been building up a successful newspaper and making a material success, he had been finishing, by personal isolated study, the education which had ceased when he was seventeen years old. Joseph Pulitzer disregarded the doctor's warnings and suffered accordingly. He lost the sight of one eye entirely and almost the entire sight of the other eye, so that he is today practically a blind man, unable to lead at all and unable to recognize his own children except by their voices. In return for this sacrifice he has established the "New York World" and demonstrated the fact in his day, as Greeley had done in his, that to be successful an editor must work for others. The "World" has done many striking things under Joseph Pulitzer's management, and, like other newspapers, it rehearses these occasionally. Most of the more utterly unimportant, as unimportant as the wars and conquests of mites in a cheese. He taught them especially to believe that the Declaration of Independence was founded on reality and not on an abstract theory subject to the review of a banking account. Of all his newspaper achievements one stands out that is especially and romantic­ally interesting: that is, the control of the issue of United States Government bonds. It was proposed by the Government of the United States, with Grover Cleveland as president and Wall Street interests as managers, to sell government bonds far below what proved to be their actual value. Joseph Pulitzer, who a few years before had landed in the United States a penniless boy, ignorant of the English language, ignorant of American purposes, checked this scheme for robbing the government. He declared that the bonds were worth more than the proposed price of issue, and to prove his sincerity he offered a million dollars in gold for those bonds at the higher price. The young boy who had come penniless from Hungary, by the real forces of pub­licity and honesty regulated the control of United States finances, at least for a short time. In telling about the life of the successful man, the best thing it seems to me is the good things he has done, without attempt­ing to set limitations, and especially with­out attempting to criticize. The weakest man can justly praise what is good; he may err preposterously in attempting to criti­cize or set limitations to another man's achievements. It can be said with certainty of Joseph Pulitzer that his life as an editor has been devoted to the actual welfare of the people as he understood it. His views have perhaps been modified by time and prosperity. He is not as radical now as he was in the old days of Carl Schurz, who saw in him the most interesting of young radicals. His attitude toward the world is perhaps not exactly that which it was before the world had begun to pay to him a revenue of a million dollars annually. He takes perhaps too kind a view of an imperfect social system, now that that social system gives him everything that he wants and more. But praise is rarely mistaken and criti­cism is mistaken nearly always. In every able man's career there appear to be two phases, one of tearing down and one of building up. Joseph Pulitzer's early years were devoted to the tearing down process. He attacked and destroyed many abuses. He has built up a great and successful engine for the expression of public opinion. Those who have received and have entertained the extremely radical views which marked Mr. Pulitzer's early days hope that he will continue to the end his fight for men belonging to the class of those who shoveled coal with him on the western river steamboat. Whatever he may do hereafter, whatever conservative influences prosperity, age, a large family and time's disillusionment may have upon him, the world will always be indebted to him for good, honest, sincere, useful work. He came here only a few years ago with many established prejudices against him, and especially against his poverty. He benefited by American institutions, and he paid back a thousand fold for the benefit that he received. He made the American idea stronger; he seized the opportunities that were offered to him; he used his brains and his ability to promote the idea that liberty and equality should be a reality.